Nestled in the heart of one of the city’s latest arts and cultures hubs, The Culture Gallery is currently hosting their latest exhibition called “Lovely Creatures”. This creative display contrasts different artistic techniques from three female artists – each with their own individual vision. Anja Venter, Mariette Burg and Shirley Fintz feature as the creative hub behind the exhibition. Venter with her ink-drawn canvasses, Burg’s emphasis on textured reverse glass painting and Fintz’s vintage inspired clay sculptures allow the viewer a chance to engage with the art medium on various different levels. “‘Lovely Creatures’ exhibition explores the inconsistency of human-perceived beauty and its relationship with nature and how it is able to affect nature in either a positive, or negative manner,” says gallery owner, Daniela Braude. Each artist has approached the theme of the exhibition in different ways, which shows off their unique techniques and talents. “I suppose my pieces are an antidote to this cold-fact culture – I created my own imaginary culture: the women are not only at one with their environment, the narratives are completely interwoven and pluralistic. The land, animals, and women stand equal as subject matter, while death is omnipresent in bones of ancestors scattered,” mentions Venter as she discusses the link between her work and the exhibition’s theme. Venter is currently doing a PhD in media studies at UCT and found her niche in ink canvas graphics. 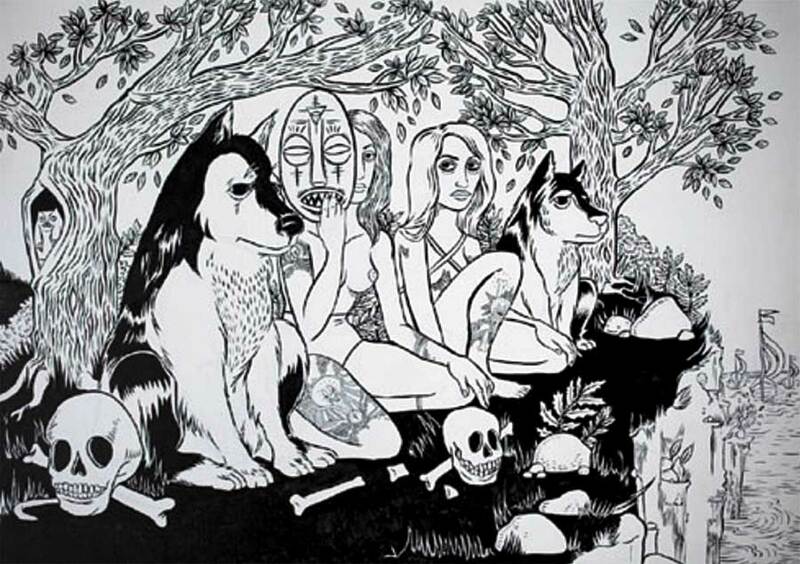 Her art has a “comic feel”, but is essentially an autobiographical representation of her femininity and its link to nature. The exhibition is a contrast of tangible, as well as intangible meanings, which is meant to evoke a questioning response from the viewer. “It is up to your interpretation as to how you infer meaning from the pieces. If you are able to connect with the piece in some way it allows for a greater understanding. Rather than seeing it as just a canvas, you could perceive it as unfolding social commentary,” says Braude. So if you fancy yourself an art aficionado, a trip to Woodstock would not be complete without visiting the Woodstock Exchange, and more specifically, The Culture Gallery. * The exhibition runs until December 14. The Culture Gallery is situated on 66 Albert Road, Woodstock Exchange, Woodstock. For more information, visit www.culturegallery.co.za.